Kulung VDC is one of the sixty three VDCs in Bhojpur district, which is in the eastern part of Nepal. The VDC is located at 1125m. height from the sea level; 27.44 degree north and 87.11 degree east. Its area is approximately 32 kilometer square and perimeter is 23 kilometer. Due to the slopy and fluctuative geographical structure, its highest and lowest altitude is 1125m. and 475m. respectively. It is situated at about 35 kilometer far from the headquarter. It lies at the middle of Nepaledanda, Chaukidanda, Sisuwa and Sittalpati VDCs. Sisuwa and Sittalpati VDCs lie in Sankhuwashava district; those are in north-astern and south-eastern part of Kulung respectively. Chaukidanda and Nepaledanda are its west and south side respectively. It has a boundary of a river, Arun and three streams, Sisuwa, Irkhuwa and Kakuwa as in east, south and west sides respectively. The population of Kulung VDC is about eighteen thousand according to 2011 A.D. census but the current is about twenty one thousand. Female population has been leading right now by few percentage: 47.75% is male and the rest, female. This VDC was named with its inhabitants 'Kulung Rai'. It is because the history of 'Rai' tribe is as long as the history of its landscape although many kinds of tribes, races and casts live there these days. Those tribes and casts are Brahmin, Kshetri, Dasnami, Rai, gurung, Ghale, Magar, Tamang etc. But 'Rai' community is still quite more. 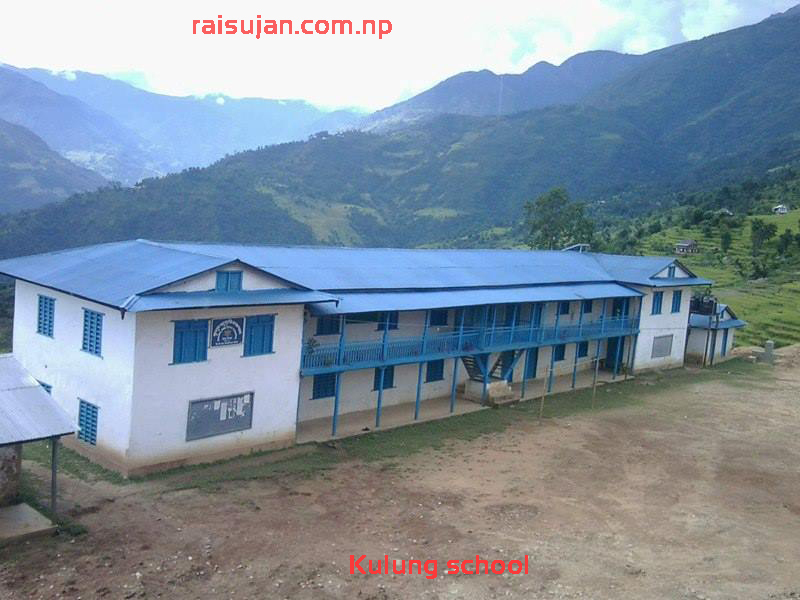 Kulung VDC is not too backward in education. 85% males and 75% females are literate. This credit goes to the early school establishment. A small primary school was established in 2018 B.S. which was turned into high school or secondary school along with the time being as Birendra Secondary School. The dreams of the locals to see it as a higher secondary turned into the reality in 2059 B.S. by upgrading as Shree Birendra Higher Secondary School. Even the Bachelor programme is running smoothly these days and the local students are being educated willingly. All of these successes became probable due to the will power, hard work and contribution of the local villagers, NGOs and INGOs. Along with the co-operation of the villagers, a philanthropist and the chairman of Nippon Nepal Good Will Association of Japan (NNA) , Yousonrbu Akino donated 3.2 million rupees and the chairman of Himalayan Help and Education Society Nepal (HHESN), Pasang Dorchi Sherpa helped and supported from the all points of view to establish a well known and facilitated higher secondary school and college. All together 1500 students have been getting good education in this school. There are nine Wards in Kulung. Every Ward has a primary school. All together there are nine primary, three lower secondary, two secondary and one higher secondary schools in the VDC. TU affiliated bachelor level too, having Management and Education programs has been running for the last 4 years. The BHSS is quite renowned for good and quality education in Bhojpur district. It has got prizes many times for quality education from the District Education Office (DEO) Bhojpur. It has been success to get 100% pass result in SLC examination continuously for three years. So, it is insisted that the trace of the conglomerated will power and desire can be seen in every lateral foliage. The climate of Kulung is good; neither it is too hot nor too cold. It is well and beneficial place for living and agriculture. The maximum temperature go up to 23 degree C. in summer and low, upto 7 degree C. The villagers grow paddy, millet, maize, barley, wheat, potato, lentils and many more. Many kinds of vegetables and fruits are also planted agriculturally according to the season. There are many facilities for the villagers these days. A selling and buying market called 'Mangalbare Bazzar' is settled on every Tuesday near by the BHSS, where most of the people, even from the neighbouring VDCs gather, sell and buy the needed goods. They meet their relatives come from the far and far. So, the weekend market has been a good meeting place. To buy goods, there are many shops in the village which are opened every day. Being aware of financial necessity, the locals have established a finance cooperative five years ago as Kulung Shahakari Shanshtha. Even a new facilitate hospital was established four years ago in the cost of two hundred million rupees. Two basic needs: drinking water and good electricity are in process permanently though there is already micro hydroelectricity project and solar system in the village. There is a government police station which gives 24 hours security to the people. Sagarmatha Highway goes through this village providing a lot of benefits to the local villagers despite the rough road. Motorcycles and tractors can travel through this road. Village Development Committee and the local level have encarved a solid decision to turn the rough road into a strong pitch within next five years. This highway has joined many VDCs of northern Bhojpur and Shankhuwashava district. The Kulung villagers and the particular locals are directly well affected from the developing highway. When the highway is fully completed it takes only one and half hour to reach to Khandbari, the headquarter of Shankhuwashava district; but on foot, it takes 5 to 6 hours. Teaching, doctoring, engineering, security forces, foreign employment, agriculture, social service, politics and business are the main professions of the locals in Kulung. Where business is new profession and the rests are the old, hereditary and chronological. Nowadays, many people do business. Selling and buying Rudraksha (a type of fruits) whose inside there is a concrete sphere called "Dana". The Dana is used to make a wreath and worn by monks and Sadhus. It is a belief that this Rudraksha plant was spouted from Shiva's tear drop, a form of God. So, people believe that if the Rudraksh Dana is inside a pocket, no harm will be there in life rather there will be secure and prosperous life. The Rudraksha can be found only in Kulung and Dingla among all over Nepal almost in the world. Dingla is a neighbour village of Kulung. So, it is precious. Most of the people have started planting it in Kulung. It has become the main income resource for the villagers. If a house has a tree of it, that man can earn minimum two hundred thousand rupees every year. A local named Dhan Prasad Rai has got 5.5 million rupees last year only by selling his Rudraksha Dana collected from the 14 trees. Such prosperous and the successful local characters are not limited in Kulung. That's why Kulung VDC's main characteristic is Rudraksha these days. Next business base is Chiraito, a type of herb, from this too people are getting more and more benefits.